3. What Is The Right Liquid to Use? 4. What are the parts of a pressure gauge? 5. What Materials Are Used for Pressure gauge building? 7. What Are The Common Gauge Errors? 8. When should you replace your pressure gauge? 9. What Specifications Should You Look Out For When Selecting a Gauge? A pressure gauge is an instrument that mechanically or digitally measures the pressure of a container or system. This can either be internal pressure or a vacuum. Gauges come in different forms, each specific to their application. There are many processes that involve pressurized gases or liquids, sometimes at ultra-high temperatures. This pressure has to be closely monitored and regulated. Any errors might result in irreparable damage to machinery, materials, and, worst of all, serious injury to the operators. Some of the systems that need monitored pressure include, swages, cylinder loads, simple shop air pressure, boilers, refineries, gas and oil pressure testing devices and various water systems. In a nutshell, differential pressure gauges measure the pressure or vacuum in two different systems simultaneously. They are used to monitor two systems whose pressure must be kept at a particular ratio. So instead of measuring the pressure in one system and another, then subtracting the two, a differential pressure gauge will accomplish that mechanically and give you one reading. For this reason, they come with two inlets, one for each container being monitored. A diaphragm gauge works a little differently from an ordinary one. The mechanisms that make the reading are moved by axles that transfer pressure from a diaphragm. The diaphragm is in turn moved by the pressure from whatever system is being monitored. 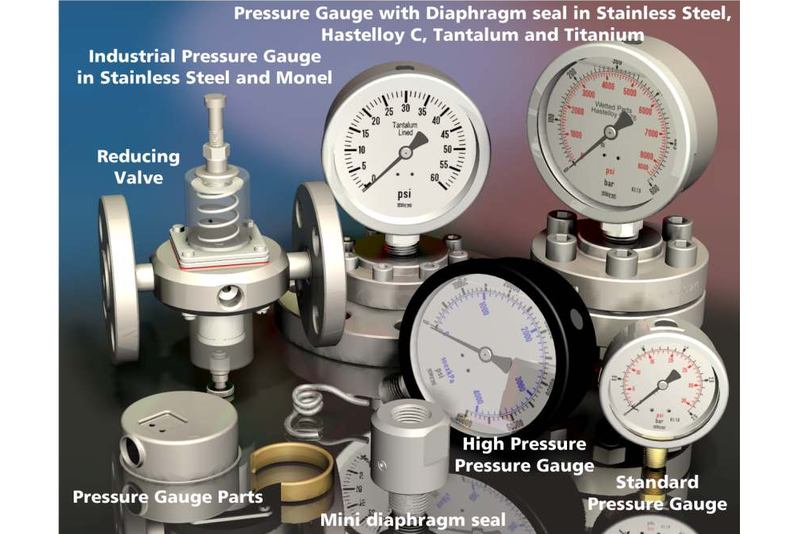 What are the mechanics involved in a diaphragm pressure gauge? The diaphragm system is quite easy to understand. It comes with a membrane that separates two sides. One side is connected to the movement system for pressure reading. This side is sealed and contains a fluid (some gas or liquid) at a preset pressure. The other side is open and that's where the fluid whose pressure is being measured enters from. Once the fluid being measured comes into contact with the membrane, it exerts a push and makes it move. Since the membrane is linked to the gear mechanism and pointer, the movement results in a reading. The harder the fluid pushes, the more pressure it displays. It is pretty easy to detect and read very high pressures. But when it comes to low subtle ones, the process can be tricky. A gauge meant to measure high pressure will most likely record no movement at all at a very low pressure. That's because the internal system is too rigid to be moved by subtle forces. That is where a low-pressure capsule gauge comes in. It comes with a diaphragm that is ultra-sensitive and will respond to very low pressures. It can be used in respirators, gas leak detectors, gas burners and more. Liquid filled pressure gauges come with their cases filled with liquid. This is usually glycerin or silicone oil. The whole inside of the gauge is filled up including the dial. It’s both clear and easy to read. One of the reasons liquid filled gauges are preferred is their ability to withstand vibration. In the dry form of the gauge, the delicate components such as the links, the needles, the pivots, etc., are prone to failure caused by vibration. This leads to inaccurate readings and general inconsistent performance. However, for the liquid filled type, the vibrations are absorbed by the filling which leaves the internal components intact. Humidity is another reason dry gauges are problematic. With water condensed inside, reading can be difficult if not impossible. Then there is the risk of freezing which would mean the internal components would be stuck. For liquid filled gauges, the threat of freezing or moisture is non-existent because of the protection of the liquid. Of course the right liquid will depend on the conditions under which the gauge will be used. However, glycerin is the most popular. It is normally good for room temperature applications but if the conditions are extreme, like excessively high or low temperatures, silicone oil does the trick. You can forget about icing if you have it in your gauge. If your system is exposed to electrical contacts, you better get yourself an oil based filling. It will provide the necessary insulation and prevent short circuits. Bourdon tube: A bourdon tube is a vital part of a pressure gauge. It transfers the pressure of the measuring fluid (gas or liquid) to the geared mechanism, which then transfers the movement to the pointing needle. It comes with an oval cross-section and has a radial form. The angle through which the tube is wound determines how much pressure the gauge can measure. For pressures under 60 bar. (approximately 870 Psi), a bourdon tube that has a radial angle of 250 degrees can be sufficient. If you want to measure pressure that goes higher than 60, you will need a pressure gauge that has a bourdon tube with multiple windings superimposed on each other. Some may come with spiral coils. The socket: The socket is used to link the gauge to the system whose pressure is being monitored. It works as a passage for the acting fluid. The socket also works as a point of attachment for the bourdon tube. It is made by means of extrusion, casting, forging, or machining. In order for the socket to be linked to the system whose pressure is to be measured, it comes with a threaded end. Moving Parts: The parts that move in order to record a reading include the pinion which is basically a rotating shaft, the hair-spring, and the sector. Spacer columns also play a mechanical role in the measuring process. 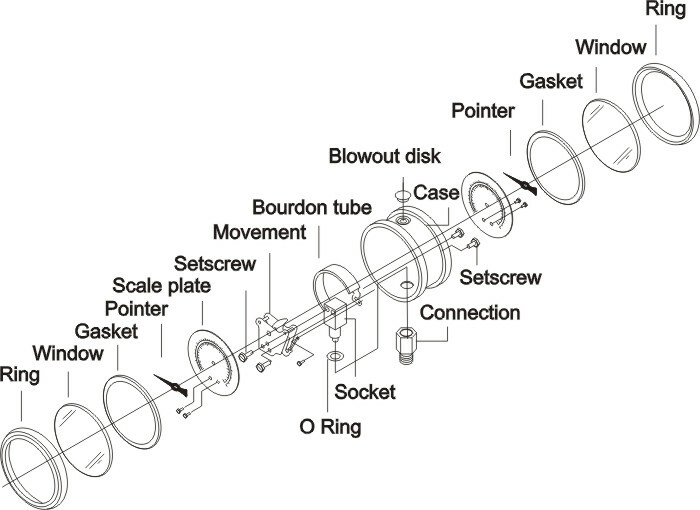 All these work to turn the movement in the bourdon tube into rotary motion. They also provide a means to calibrate and adjust the gauge. Gauge Case: The case holds all the internal components of the pressure gauge. It can be made of a wide range of materials from plastic to different sorts of alloys. It all depends on the environment in which the gauge will be operated. If the environment is demanding, say, in high temperatures or exposure to corrosive substances, the casing may be made of tougher metal alloys such as stainless steel. A lot of materials go into the building of a pressure gauge. One of the criteria used when selecting the materials is their ability to be spring tempered. Spring tempering is a type of heat treatment that allows a component to retain its shape even after much stretching under a force. Most metals are naturally elastic to some extent and heat-treating them only enhances this property. Material for the Bourdon Tube: Bourdon tubes can be made of beryllium copper, phosphor bronze, various alloys of iron, and stainless steel. Choosing the right material all comes down to the corrosive properties of the medium whose pressure is being monitored. Steel fares pretty well in oil but performs terribly when it comes to water or any aqueous fluid and needs to be stainless. Stainless steel is costly but it is highly corrosion resistant. If you are trying to monitor very high pressure systems, beryllium copper is the material to choose for the bourdon tube. The Socket: Brass is the most common material for the socket. It is also made of steel and stainless steel and aluminum. If weight is an important factor, the socket can be built from aluminum. The only limitation to overcome when using aluminum for the socket is that it's difficult to attach to the bourdon tube by soldering or brazing. Extrusions and rolled bat types are popularly used. The movement assembly: The movement assembly, which is the inner component responsible for recording and indicating the pressure, is made from different materials including glass, brass, stainless steel, or nickel silver. For a particular material to be suitable for the movement mechanism, it has to have the least friction properties possible. The Case: The casing has to be strong enough to protect the inner components of the gauge from external elements. It can be made of plastic, aluminum, brass, steel or stainless steel. Polycarbonate and polypropylene are also great casing materials. The Pointer: The pointer allows the operator to read the pressure measurements. It can be made from any of the common metals, aluminum, steel, stainless steel, plastics, and even glass. The Viewing Lens: The viewing lens is supposed to be as transparent as possible. For this, glass would be the proper material but in most cases, acrylic is used. That's because of the safety implications of using glass if it breaks. There are all sorts of pressure gauges on the market, and it would be confusing if you were a novice trying to get one. To help you get the right gauge, here are some questions you can ask yourself. What fluid am I monitoring? The type of fluid whose pressure you will be measuring will determine what materials your gauge can be made from. Especially when it comes to the wetted components like the bourdon tube and the socket. The idea is to get materials that won't corrode upon being exposed to your fluid. What is the temperature of the fluid I’ll be measuring? The temperature at which your fluid will be as you measure the pressure will determine not only the materials but also the type of gauge you can use. For high temperatures, a few special considerations should be made. Firstly, the material must be able to withstand high levels of heat. Furthermore, there has to be a form of buffer between the gauge and the system being monitored. This could be a long pipe, a siphon, or a diaphragm seal assembly. By the time the fluid reaches the gauge, it will have dissipated its heat. In what environment will the gauge be used? You also have to understand the environment in which the gauge will be operated. This will help you choose the right gauge casing material. If, for example, the ambient conditions will be corrosive, the right gauge should have a casing and window that can withstand such conditions. What is the pressure range of the system I am monitoring? It's very important to match the capabilities of your gauge with the pressure levels of the system you are monitoring. The right approach is to get a gauge that can record double the pressure you are dealing with. For example, if your system can have pressures of 200 psi, your gauge should be able to handle pressures of 400 psi. Low-pressure gauges should be used if you are dealing with very low subtle pressures, for example for gas leak detection, respirators, etc. These will be able to pick even the slightest changes in pressure due to their sensitivity. Are there any vibrations or pressure spikes? You also have to consider other conditions that may affect your gauge including vibrations, sudden surges in pressure, pulsations, and temperature fluctuations. These may affect the lifespan of a gauge if it is not designed to be used under these conditions. For example, if your gauge will be exposed to too much vibration, you would benefit from a liquid filled gauge. If there are pulses in the media you are measuring, you can insert a “throttle plug”, or restricting accessory. Do I need it for special purposes? There are special processes that won't use just any gauge. Using the wrong one might lead to incorrect readings and damage to the gauge. Process gauges are specifically designed to withstand specific conditions and will break down if used for something else, comparable to a vacuum gauge being used as pressure gauge, or corrosive fuels like Skydrol® being used in a standard gauge. What is the accuracy range required? Some processes require utmost accuracy for the best results. Understand your system and the level of accuracy required, then select the appropriate gauge. In most processes, a tolerance of 0.5 to 1 percent is acceptable. “Test” Gauges can go well beyond that accuracy, but the cost significantly increases as accuracy increases. What is the required readability of the gauge? You should consider how far the operator will be from the gauge to determine what size dial you should get. If the system will require that the operator reads the gauge from a distance, it must have a big dial for easy reading. You should also consider getting a big dial if there will be obscuring conditions like steam or smoke. A smaller dial with an easy to read digital display is also a good option, but will cost a bit more. There are some common gauge errors to watch out for that may distort pressure readings. Here are 5 of the most common ones. Zero Error: A zero error is either a negative or positive reading when the pointer is supposed to be at zero. This is usually caused by shock, for example, if the gauge is dropped, or by extreme pressure, as in “over” pressure surges. It is a sign of a dysfunctional bourdon tube resulting from a permanent set instead of returning to its original shape and size. Correcting zero errors in pressure gauges is easy. It involves removing the lens to reach the point and manually setting it at zero when the gauge is not subjected to any pressure, provided you have a removable dial face. Span Error: The span of a gauge is the difference between the lowest possible readings and the highest. 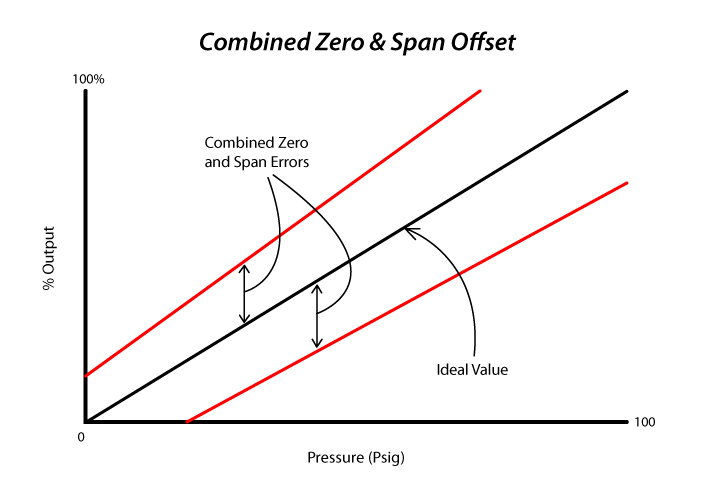 A span error occurs when the pressure exceeds the full scale. The greater the applied pressure, the greater the error. The optimum gauge should read in the middle 1/3rd of the span of the gauge. Linearity Errors: Sometimes, even if a gauge has no zero or span error, it may still give wrong readings due to linear errors. These errors may occur at different points and are basically a result of varying sensitivity as the gauge is subjected to different pressure levels. In a standard mechanical “ANSI Grade” gauge, the middle 1/3rd of the scale is the most accurate. Hysteresis: Hysteresis is caused by defective bourdon curves. They occur when the gauge records different readings at certain points as the pressure is increased and as it is lowered. Hysteresis is impossible to remedy by simply adjusting the needle position. It needs time for the internal workings to reset properly. 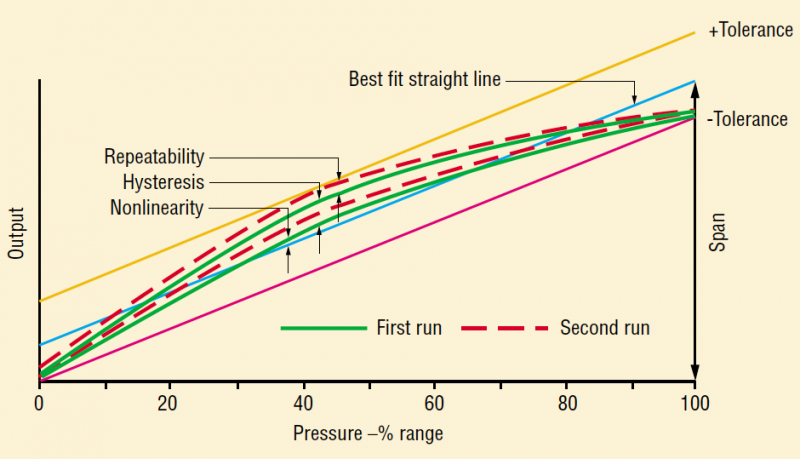 Friction Errors: These result in undue friction holding back the internal movement mechanism of the gauge. They are manifested when the gauge records a different reading after being tapped. This is usually caused by foreign material stuck inside the mechanism or a hairspring that is not correctly tensioned. Also, a great reason to liquid fill your gauge. While gauges can be repaired and remedied if they are exhibiting errors, there are times when the only option you have is to replace them. The question now stands, how do you know that it's time to replace a pressure gauge? Here are 7 instances. Excessive span shift: If your gauge shows an exaggerated span shift, it might be a sign that the bourdon tube has become too thin as a result of corrosion. The span shift should be under 10% and no more. Excessive zero shift: This might mean the bourdon tube has been exposed to too much pressure and has stresses that are affecting its function. Zero shifts should be kept under 25%. If it goes beyond that, it might be time to replace the gauge. Signs of leakage: If the gauge shows any indications of corrosion and leakages, practically nothing can be done and it should be replaced. Exposure to high temperatures: If your gauge has been exposed to high temperatures that it is not supposed to endure, you might want to replace it. In most cases, soft soldered gauges should not be exposed to temperatures of more than 250 degrees Fahrenheit, while brazed ones should be kept away from temperatures of 450 degrees or more. For welded gauges, the limit is 750 degrees Fahrenheit. Extensive friction error: If your gauge exhibits too much friction error, it might be time to replace it. It is a sign that the movement has suffered much wear and cannot perform its function accurately. Damaged sockets: Damaged sockets will hamper the connection between the gauge and the system whose pressure is being monitored. This usually comes as damaged threads which make it difficult to connect without leakages. Loss of case fill: If you have a liquid-filled gauge that seems to have lost its liquid filling, you need to replace it. Liquid filled gauges are not designed to be used without the filling and will be prone to erroneous pressure recordings and quick damage. When buying your gauge, you will come across different specifications. It is important that you understand these for you to get the right one. Working Pressure Range: This is the normal pressure your gauge can be subjected to without any risks of damage or erroneous readings. This should be in the middle 1/3rd of your gauge. You should, therefore, match your system's expected pressure range with that of the middle range of your gauge. Pressure gauges are not very accurate as you approach the upper-pressure limit. They give the most accurate results within the middle third of the dial. For this reason, you should get 1.5 X or double the expected pressure of your system. Dial Diameter: This is as the name implies - the diameter of the dial of the gauge, which means how wide its face is. If you need precise readings, a wide diameter is the best for its visual clarity. A digital display is more expensive, but if size restrictions exist, this is the way to go. Accuracy: This is the difference between the actual pressure value and the one displayed by the gauge. It shows different errors resulting from the observer, apparatus, and the environment in which the gauge is being used. The more accurate a gauge is, the more it costs. Some applications need highly accurate “Test” gauges, while others can do with more tolerance and leeway. A pressure gauge for your swimming pool might do with an accuracy of 3-2-3. This means in the first third of the dial, the gauge has an accuracy of 3%, in the second third, 2%, and 3% in the last third. Some “Test” gauges can be as precise as to have 0.25% accuracy or more. Operating Temperature: This includes both ambient and media heat levels. If the actual ambient and media temperature greatly differs from the temperature the gauge was designed to operate in, its operation can be hampered. You can also expect such a gauge to wear quite quickly. Mount Location: There are four mount locations. Choosing the right mount location all comes down to the application and the environment the gauge will be operated in. Bottom Mount: In this type, the connection is at the bottom of the gauge. It is also called a stem mount. Back Mount: A back mount is located behind the gauge, in the center. Flange Mount: This type uses a flange to mount the gauge around the face or at the back of the pressure gauge. Lower Back Mount: A lower back mount is located behind the gauge, in the center or towards the bottom. Scale Type: The scale can be found on the face of the gauge. The scale can determine how accurate the reading will be. The smaller scales offer more precision. Some gauges have dual scale (Bar & Psi), while some have one. Pressure gauges are completely mechanical instruments. Therefore, it is important to pay attention to three process conditions that may hinder the accurate recording of pressure and even lead to early gauge damage. Both the ambient and process temperatures will affect the working of your pressure gauge. For every 10 degrees increase or decrease from the temperature the gauge was calibrated from, it will display errors in the 0.4% range. That's because the physical properties of the inner mechanism changes, particularly the bourdon tube whose spring properties are greatly affected by temperature. It is not exactly easy to navigate around this problem but it can be mitigated with the use of coil or pig syphon. These will allow the media to lose its heat before getting to the gauge. You can also use a diaphragm seal to keep the gauge separated from the subject system. Most processes involve a lot of vibration from motors, pumps, and any oscillating or rotating equipment. This vibration can quickly lead to gauge failure due to its impact on the internal components including the gear mechanism, the bourdon tube, and the movement. Premature failure is not the only problem caused by vibration, it also makes it difficult to read the gauge dial. Apart from the fact that it's hard to clearly see something that is vibrating, the fact that the needle is always oscillating makes reading even harder. The most popular approach to this problem is to use a liquid-filled gauge. The filling, which is usually glycerin or silicone oil, acts as a shock absorber and protects the inner components from excessive vibration. There are often pulsation occurrences around the discharge of pumps. It can also occur where there are quick operating valves. Although many people think simply using a liquid-filled gauge makes the problem disappear, this is actually a flawed approach. Liquid-filled gauges can lessen the effects of pulsation but do not entirely solve the problem. A thorough remedy involves installing pulsation dampeners “snubber” in the gauge socket. You have the option to use either a piston snubber, a metallic snubber that is sintered, or an in-flow restrictor with threads. You can also use a needle valve, so long you leave it a little open. This is a very popular remedy to pulsation, but it has to be accompanied by some other method just in case of failure. If you are dealing with gases or liquids with very low viscosity, you could use a threaded orifice to save money. If the fluid in question is too heavy, your best option is a piston snubber. When power is deployed with a healthy dose of control, good things usually happen. More so when your precious equipment is involved. And when it comes to pressure gauges, the hydraulic kind will never let you down. Supplied pre-calibrated, the hydraulic pressure gauges in our range are designed for tough, demanding use environments and rigorous operation. They guarantee safe operation of heavy hydraulic equipment by reporting accurate pressure readings at all times. Browse our selection to find the right hydraulic gauge for your needs.